Before the Advent season, I sat down with some of my Bible reference books to learn about biblical highways. There were several major Middle Eastern highways in the biblical land, in addition to the local roads that Jesus and others traveled. Here are some of my notes from several Bible dictionary articles. The Via Maris then reached Megiddo and had at least three different branches, one along the Sea to Syrian Antioch, and another route eastward to the city of Beth-shan and then north to the Sea of Galilee and then along the western shore of that see to Gennesaret. The third branch crossed the Jezreel Valley, through the hills of Nazareth and near Mt. Moreh, and then made and eastward then northward path where it met the road from Beth-shan near the Sea of Galilee. From the northern places then road continued to other areas , including a long road from Aleppo along the Euphrates River to Babylon, Uruk, Ur, and the Persian Gulf. (3) If you consult a map that illustrates this route and shows you these towns, you can get a better idea of the extensive reach of this particular highway system. The kind of highway named by the Hebrew word derekh (Num. 20:17, 19, Judg. 21:19) “was the most common type of road in ancient Israel, formed through continual use compressing the soil and removing vegetation, and sometimes improved. The mesilla (built-up road) was intentionally constructed with a high center and drainage on the edges. This type only became common in the Roman era.” The usage of the words was variable: the derekh of Jeremiah 18:15 is not built up, while the derekh of Job 19:12 is built-up. (17) As reflected in passages such as Prov. 15:19, Prov. 22:5. Isa. 40:3, Isa. 57:14, Isa. 62:10, and Hos. 2:6, a typical road was constructed by filling holes on the path, removing large stones and brush, and leveling the path. (18) Roman highways, however, were famously much more sophisticated and lasting. 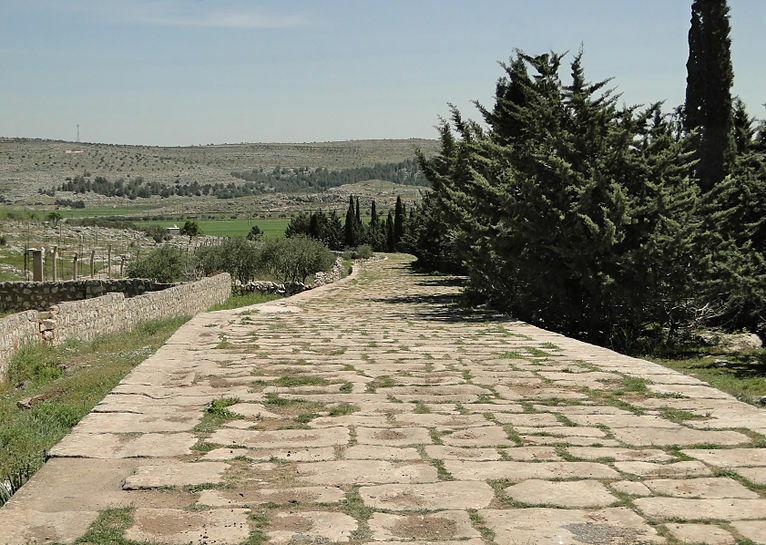 Of course, we think of the Jericho road where the Samaritan of Jesus’ story became Good. Emmaus (at least the place archaeologists believe the town existed) was about seven miles northwest of Jerusalem, and it was along that road where Jesus met the two downcast disciples in Luke 24. And the Via Dolorosa is today a Jerusalem street but was a portion of a Roman-era road that passed through the city. 1. Lincoln Blumell, “Travel and Communication in the NT,” The New Interpreter’s Bible Dictionary, Vol. 5, S-Z (Nashville: Abingdon Press, 2009), 656-657. 4 .Gregory L. Linton, “King’s Highway,” The New Interpreter’s Bible Dictionary, Vol. 3, I-Ma (Nashville: Abingdon Press, 2008), 523. 5. Beitzel, “Roads and Highways (Pre-Roman) 779. 6. Linton, “King’s Highway,” 523. 7. Beitzel, “Roads and Highways (Pre-Roman), 780. 11. Linton, “King’s Highway,” 523. 14. Gregory L. Linton, “Road,” The New Interpreter’s Bible Dictionary, Vol. 4, Me-R (Nashville: Abingdon Press, 2009), 826. 17. Michael G. Vanzant, “Highway,” The New Interpreter’s Bible Dictionary, Vol. 4, Me-R (Nashville: Abingdon Press, 2009), 654. 19. Vanzant, “Highway,” 654; Linton, “Road,” 825. 20. Vanzant, “Travel and Communication in the OT,” 656-657. 21. Blumell, “Travel and Communication in the NT,” 653. F. F. Bruce, “Travel and Communication in the NT,” The Anchor Bible Dictionary, Vol. 6, Si-Z (New York: Doubleday, 1992), 648-653. David F. Graf, Benjamin Isaac, Israel Roll, “Roads and Highways (Roman),” The Anchor Bible Dictionary, Vol. 5, O-Sh (New York: Doubleday, 1992), 782-787. At Barnes & Noble the other day, I picked up a copy of the November 2012 International Record Reviewfor an article about the composer Thomas Adès. 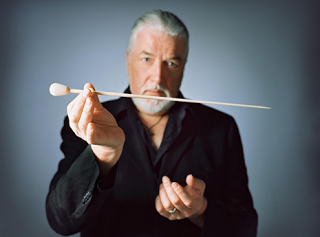 But I noticed a CD review for a new recording: “Concerto for Group and Orchestra” by Jon Lord. I still have my LP of the premier of this piece, at Royal Albert Hall in 1969. The group was Deep Purple, for which Lord (on the far left in this picture) was the keyboard performer and leader for many years, and the orchestra was the Royal Philharmonic conducted by Malcolm Arnold, whose name I didn’t know when I bought the record in ’72 but who I now know was a distinguished composer and symphonist. I also didn’t realize at the time that this was the first Deep Purple LP with the group’s famous “Mark II” lineup. I’d already purchased their albums “In Rock” and “Machine Head,” as well as their first album with the original lineup, “Shades of Deep Purple.” Also, singer Ian Gillan, with his strong voice and famous ability to scream on pitch, was Jesus on the “Jesus Christ Superstar” concept album. 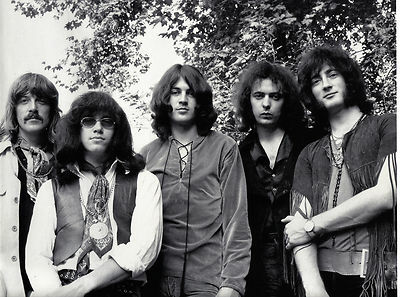 All in all, Deep Purple was certainly a group that I loved and played a lot during my teenage years. Late last fall, I listened to the Diane Rehm radio show as I drove to the supermarket, and her guest that day was Eleanor Jones Harvey, senior curator of the Smithsonian American Art Museum. Harvey discussed her upcoming book, “The Civil War and American Art” (Smithsonian American Art Museum and Yale University Press, 2012), resulting in turn from the museum’s exhibition. I pre-ordered the book once I got home and it arrived in time to be enjoyable Christmas holiday study. Harvey writes, “Surprisingly few American painters engaged directly with the war as it was being fought. There was little market for depictions of Americans killing one another, and artists found it difficult to immediately identify heroes and pivotal battles. Without the luxury of time and reflection, these artists approached the Civil War in a more elliptical matter” (p. 1). That elliptical manner and use of metaphors are among the things so fascinating about the paintings depicted and discussed in this book. For instance, George Caleb Bingham painted Order No. 11 (1865-1870), depicting a forced evacuation of homesteaders from western Missouri, but Bingham protests the evacuation by invoking 15th century paintings Expulsion from Paradise by Masaccio and The Lamentation by Petrus Christus (p. 12-13). The depiction of Arctic ice in Frederic Edwin Church’s beautiful The Icebergs (1861) calls attention to a contemporary image, in Washington DC and elsewhere, that slavery’s end was as inevitable as icebergs melting tropical water (pp. 31-32). Harvey writes, “During the first half of the nineteenth century, landscape painting was a simulacrum of American Life and values. Landscape metaphors and imagery permeated the American consciousness” (p. 19). Opposite that quotation is the example of Asher Durand’s Kindred Spirits (1849), one of my own favorite paintings. But a common metaphor for the war was ominous weather, and landscape paintings began to look darker, like Martin Johnson Heade’s Approaching Thunder Storm from 1859 and Sanford Robinson Gifford’s A Coming Storm from 1863 (p. 64). A haunting painting is the enigmatic The Girl I Left Behind Me from circa 1872, by Eastman Johnson, depicting a young woman standing in a strong wind (p. 230). Also haunting are a pair of paintings by John Frederick Kensett, Sunrise Among the Rocks of Paradise, Newport (1859) and Paradise Rocks, Newport (circa 1865), the very same scene, but the second painting is so much darker and more somber (pp. 68-69). 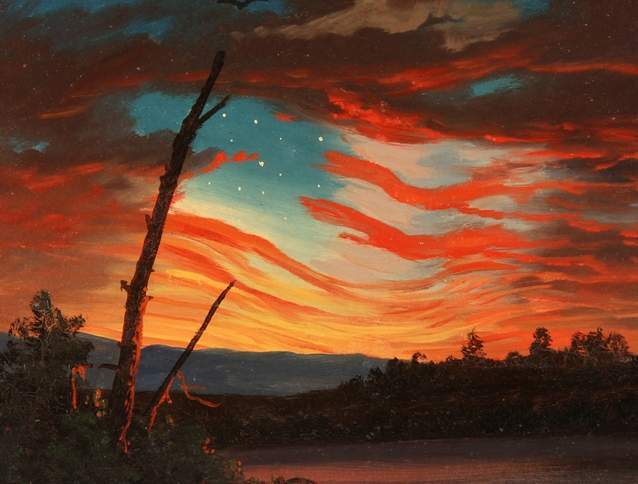 There were also battlefield paintings, such as Frederic Edwin Church’s Our Banner in the Sky (1861, p. 38, the one I inserted above), James Hopes’ Battle of Antietam, September 17, 1862 and Bloody Lane (p. 7), Winslow Homer’s Sharpshooter (1863, p. 150), his Skirmish in the Wilderness (1864, pp. 158-159), and Gifford’s The Camp of the Seventh Regiment near Frederick, Maryland (1863, p. 126). I’m putting together a future college course about religion during the Civil War, and one painting reflecting that experience is Gifford’s Preaching to the Troops, or Sunday Morning at Camp Cameron near Washington, May 1861 (pp. 116-117). Artists also movingly depicted the lives of free blacks and recently freed slaves, like Thomas Waterman Wood’s A Bit of War History: The Contraband, The Recruit, and The Veteran (1866, p. 209), Edwin White’s Thoughts of Liberia, Emancipation (p. 210, reflecting the controversial idea of sending blacks back to Africa), Eastman Johnson’s The Lord is My Shepherd (1863), his A Ride for Liberty—The Fugitive Slaves, March 2, 1862 (1862, p. 201), and Homer’s A Visit from the Old Mistress (1876, p. 219), reflecting “the dismay felt by an overwhelming majority of former slaveholders that their slaves did not in fact love them or wish to be enslaved” (p. 218). Harvey also examines wartime photography, since the Civil War was the first war in which photography (and the often gruesome images of battlefield casualities) was important. I love Hudson River School paintings and mentioned a book about the school in my 7/2/12 post. Harvey’s book depicts how the “primal experience of nature” depicted in those earlier paintings carried over into paintings of the 1850s and after—but became more stark and reflective of the national tragedy (pp. 17, 19). It is also an excellent source for those of us who love studying the Civil War, and she quotes many writers and politicians of the time as she discusses the pre-war years, the war itself, Reconstruction, and Reconstruction’s collapse. Of course the photographs and paintings are interesting to appreciate as you leaf through the pages, but the chapters are very informative and interesting. I always resented the song “White Christmas,” just a little bit. It’s a lovely song, vastly popular, of course. But I thought it set up the yearly, often disappointed expectation of snow on Christmas day. (The seldom-heard introduction refers to the usually snow-free Beverly Hills which elicits nostalgia for snowy holidays past.) 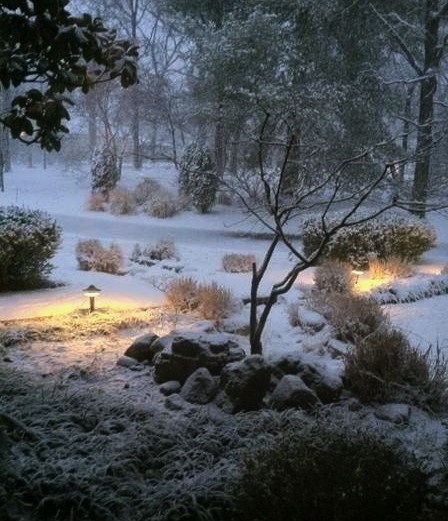 What does it matter if snow falls on Christmas or not? 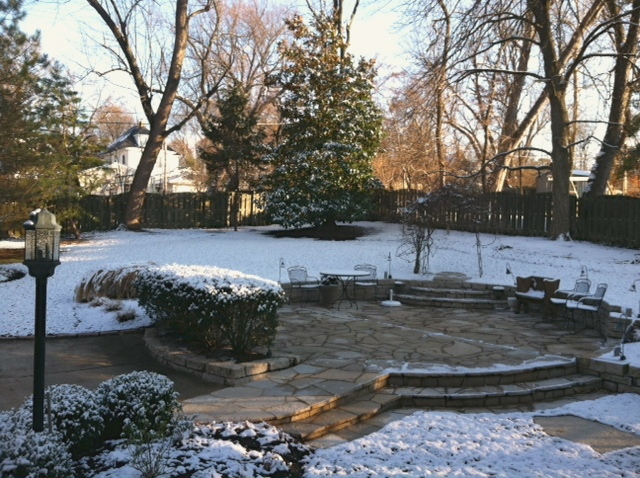 But I realized there is much more to the expectation of a snowy Christmas! The Christmas 2012 issue of BBC Music magazine has an interesting article, “A Christmas Carol” (pp. 27-34) by David Owen Norris. The author writes that, in pre-Victorian England, harvest season was poised to be a more beloved time of year than Christmas; harvest time rather than Christmas had an appealing narrative of well-being, plenty, and human relationships, while Christmas was just a cold winter holiday that elicited painful longing. However, Norris states that Christmas carols began to make a comeback during the early Victorian period, eclipsing harvest-related hymns. Consequently, Christmas grew in popularity during the 1800s, partly on the basis of this musical appeal. The real innovation, though, came from Rev. John Mason Neale (1818-1866). He and a colleague produced hymn books for churches. A 16th century Finnish song concerning spring and flowers inspired Neale to write new lyrics, which became “Good King Wenceslas.” What was so innovative about Neale’s song, is that it is the first time a Christmas song links the holiday with snow (p. 31)! You would think someone would have associated snow and Christmas, but according to Norris, other songwriters (even Scandinavians) had made reference to Christmas cold weather (“The First Noel” is an example) but not to Christmas snow. Neale’s association of snow and Christmas was brilliant and influential. From the publication of “Good King Wenceslas” in 1853, other poets and songwriters found inspiration in the image of Christmas snow, notably Christina Rossetti’s “In the Bleak Midwinter,” but also many others (pp. 31, 33). Furthermore, that affirmation of miracles was better expressed through song than prose. “Only song could convey these new meanings of Christmas snow… The familiar yet fundamentally irrational human act of singing together was the perfect medium. (Irrationality is important to us in matters of the spirit: look at the idea of carols by candlelight, which could only become truly symbolic once electricity had made the candles pointless.)…. “The very mirage of a white Christmas… became a new way of thinking about miracles, allowing snow to become the outward sign of an inward grace—a secular sacrament. Snow imagined, snow longed for, makes space for a Christmas miracle” (p. 34).